Fields in FlickStart commands can be calculated at the time a command is used through the expression mechanism. Expressions can store values in variables through the assignment operator ('=') and the values in the variables can be used in subsequent commands. Expressions can contain the usual operators such as '+' and '-', parentheses, and a large range of functions such as sin and cos. The operands can be numbers or variables or whole expressions in parentheses. FlickStart provides a number of built-in variables that contain information generated when built-in functions are invoked. For a detailed description of how expressions work in FlickStart see the expressions section in the FlickStart Manual. A number of command groups (tags) have been created using the expression capability. Some of the existing tags have been extended to include new functions based on expressions. The tags are listed here. You can access the same information from within FlickStart when you choose the current tab help from the menu while viewing the 'TAGS' tab. The groups of commands share similar functions introduced by similar keywods. sms send [contact] [message...] - Immediately sends an SMS to the contact named with the body of the SMS set to whatever is said after the contact name. sms reply [message...] - Immediately sends an SMS to the person whose SMS is the most recently received. The body of the SMS is set to whatever is said after the word 'reply'. sms send [number] [message...] - If you know a mobile number by heart you can use this command. It immediately sends an SMS to the mobile number with the body of the SMS set to whatever is said after the number. sms last - Speaks the last SMS received regardless of who sent it. sms last [contact] - Speaks the last SMS received from the contact cited. sms sent - Speaks the last SMS sent regardless of who it was sent to. sms sent [contact] - Speaks the last SMS sent to the contact cited. sms body [text] - Starts an SMS body, putting the spoken text into it. sms add [text] - Adds the spoken text at the end of the existing SMS body. sms undo - Removes the last spoken text from the end of the existing SMS body. The undo can be done multiple times. sms phone [contact] - Sets the phone (phone number) for the SMS using the mobile phone from the contacts database. sms reset - Blanks the body and phone of the SMS being constructed. sms say body - Plays back the current SMS body. sms say phone - Tells you who is the target for the current SMS. sms send saved - Immediately sends the constructed SMS body to the constructed phone. sms compose - Delivers the current SMS to the default SMS app for review. 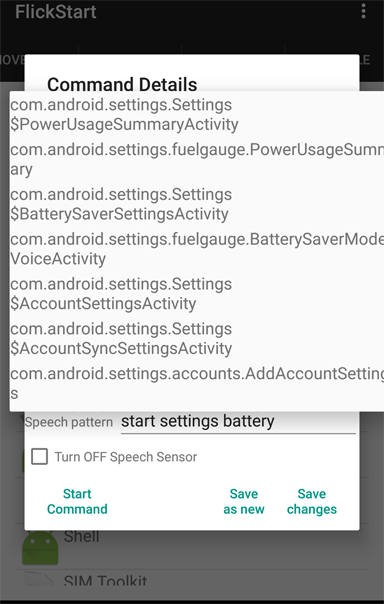 sms summary - For information on immediate send and also playback commands. sms summary build - For information on building up an SMS before sending. There are two sets of commands in this tag. One set does queries into the calendar, while the other set creates events for insertion to the calendar. Queries search the title, description and location fields of events. calendar find [query text] - Forward search. calendar next - Finds the next calendar event. calendar next again - Returns the event after the last one. calendar reverse find [query text] - Search past events. calendar previous - Finds the last calendar event. calendar previous again - Returns the event before the last one. calendar title [text] - Puts the text into the title field of the event being formed. calendar description [text] - Puts the text into the description field of the event being formed. calendar location [text] - Puts the text into the location field of the event being formed. calendar start [text] - Puts the text into the start time field of the event being formed. calendar end [text] - Puts the text into the end time field of the event being formed. calendar duration [text] - Puts the text into the duration field of the event being formed. calendar reset - Blanks all the fields of the event being formed. For each of the commands that sets a field in the event, there is another that plays it back (eg. 'calendar say description') so that you can check them. At some point a new event is ready to commit to the calendar and you either use the command 'calendar save' to insert the event into the calendar, or the command 'calendar compose' to fire up the Calendar App and fill the parts into a new event ready for you to do the save manually. The expression evaluation capability in FlickStart fields makes it easy to create a simple voice operated calculator. The commands in this tag are set up to create a calculator with memory, so you can build up a result bit by bit. In addition, the commands provide access to the clipboard (if it contains a number). All the commands start with the word 'calculator' so they don't get confused with any other active commands. calculator set [expression] - Sets the result held by the calculator to the value of the expression. The result is also spoken. calculator invert - Sets the result held by the calculator to 1.0/(last calculated result). Expressions follow normal rules for precedence, so if you say '5 plus 2 times 3' you get 11 not 21. You can also use the word 'bracket' for an open or close bracket. For instance '3 times bracket 2.1 plus 4.5 bracket' would come out like '3x(2.1+4.5)'. There are also operators like 'squared' and 'cubed', but none for square root or cube root. For more detail on expressions see the manual section on expressions. calculator convert to [text1] from [text2] - For example 'calculator convert to kilos from pounds'. calculator convert from [text1] to [text2] - For example 'calculator convert from litres to pints'. calculator clip set - Set the clipboard to the last calculated value. calculator plus clip - Set the calculated result to (last calculated value)+(clipboard value). calculator minus clip - Set the calculated result to (last calculated value)-(clipboard value). calculator times clip - Set the calculated result to (last calculated value)*(clipboard value). calculator multiplied by clip - Set the calculated result to (last calculated value)*(clipboard value). calculator divide by clip - Set the calculated result to (last calculated value)/(clipboard value). calculator over clip - Set the calculated result to (last calculated value)/(clipboard value). where 'to' and 'from' are reversed as it is hard to remember which order is expected by the commands. The tag may seem to have a lot more commands than it needs, but the excess commands deal with cases where the the first unit might be one, two or three words. Also included in the tag are examples which are tailored for specific conversions. If you have conversions that you do regularly you can design specific commands that let you reduce the amount of information you need to say in order for the command to trigger. Length - The units can be Metric (eg. meters) and Imperial (eg. yards). Volume - The units can be Metric (eg. liters), Imperial (eg. gallons) and US (eg. us gallon). Mass - The units can be Metric (eg. kilograms), Imperial/US (eg. ton) where the Imperial and US differ put "us" in front. The US prefix can be used for hundred weight and ton. Temperature - The units can be Celcius, Fahrenheit and Kelvin. Currency - The to and from text can be a currency (eg. shilling), but if there is more than one country using the same currency name you will need to add a country name in front. In fact the country name is enough to select a currency for countries that have their own currency. You can also use the 3 letter currency codes (eg. USD, EUR, etc.). A parallel set of commands to the ones above use the clipboard as the source of the number requiring conversion. The commands use the word 'clip' where the number would have been in the commands above. The clipboard can be used as the intermediate storage if you use the voice calculator commands to produce a number which needs conversion. 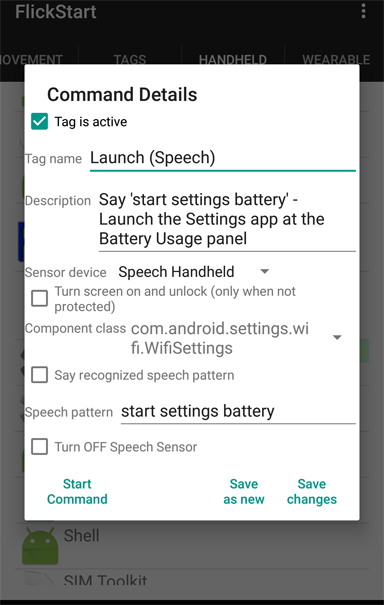 The set of commands in this tag let you launch apps by voice regardless of what is on-screen, or even when the screen is off. All the commands begin with the word 'start' and are followed by the app name or some shorthand for the app name (eg. 'start maps' will start Google Maps). 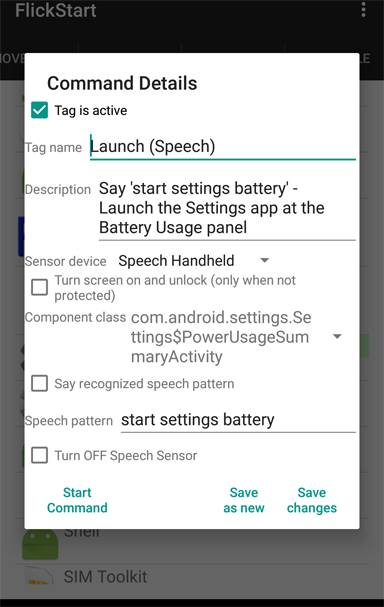 There are also some commands which use a third word to select a specific part of an app (eg. 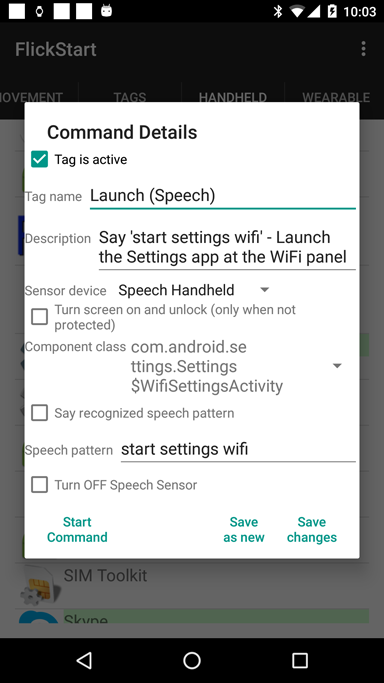 'start settings wifi' brings up the WiFi screen in Settings). 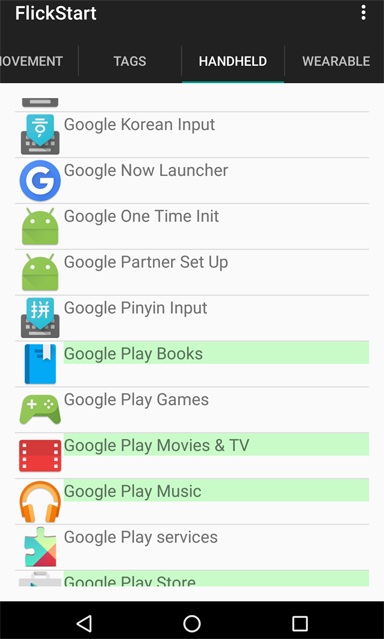 Most of the apps represented in the command list are basic Android apps, along with a few well known apps. It is suggested you delete commands that refer to apps you don't use. You can easily change the trigger words for the commands from the TAGS tab by tapping on the 'Launch (Speech)' tag and then tapping on a command you want to alter. Inside the command, the field called 'Speech pattern' is the one you should alter if you want to start the app using different words. 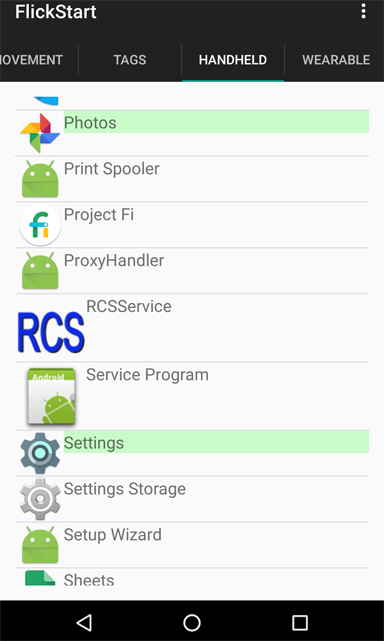 Since you are likely to want to launch apps not in the current list, we will go through the process of creating a couple of these commands as a guide. 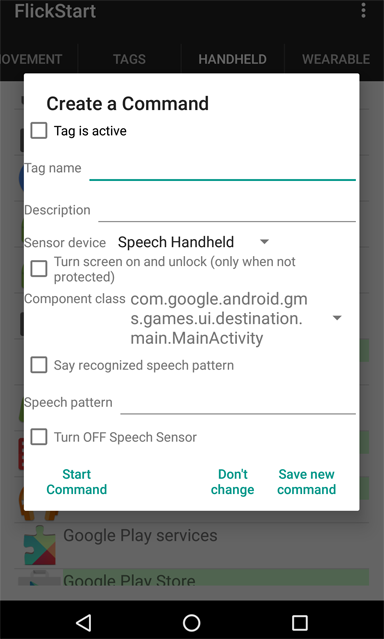 Finally tap the 'Save changes' button and the command is ready for use (assuming the 'Launch (Speech)' tag is active and the Speech Sensor button in the MOVEMENT tab is green). As we started with an existing command, the buttons at the bottom of the panel give us two choices. We can replace the original command (using the 'Save changes' option), or leave the original command and save this panel as an entirely new command (using the 'Save as new' option). In this case we would choose 'Save as new'. The component class choice was perhaps the most difficult step in the whole process we just went through. Apps like 'Settings' offer a huge number of choices and it won't always be clear which to choose. Experimentation is likely to be required in many cases as the choices are unlikely to be documented. You can use the 'Start Command' button after choosing an entry in the list to test your choice. The commands in this tag make use of a number of characteristics of date variables in expressions. Works out a future or past date - You can use the 'date [text]' command to get the actual date when you express it in a relative way. For instance you can use terms like "last Friday", "Tuesday next", "today" and so on to get a response telling you the actual date. The time difference between some city and your location - The command 'time diff [city] responds with a time difference in hours. Current time - Saying 'time now' produces a response of the current time. From these commands you can construct others. For instance you could take the 'time diff [city]' command and make a new one which calculated the time difference between any two cities. The examples in this tag use the built-in calculation and charting functions. The examples are built around one or more formulas which are used to calculate the points on a graph (or set of graphs). A chart is built by evaluating the formulas in a loop and varying the value of a key variable slightly each time around the loop. Voice control is provided to force a redraw of the chart with new parameters. 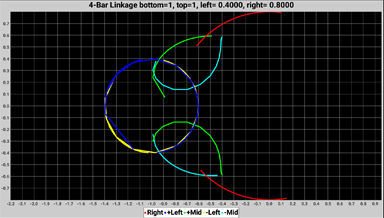 Lissajous Pattern - Draws curves derived from two out of phase sine waves. 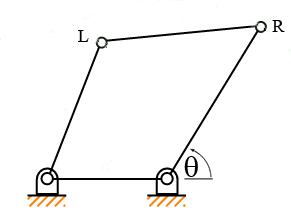 4-Bar LinkageShows the paths of points on a 4 bar linkage used in mechanical engineering. Cubic Function - Draws a simple cubic curve. Cardioid Pattern - Draws the standard Cardiod curve. The last example has no parameters and always draws the same curve. The first three examples each have an initialization command which should be used first to assign reasonable starting values. After the intialization command, you can use another where you specify a new value for one of the parameters. The curve(s) will be redrawn with the new parameter value. The commands set parameter values using names like 'top' and 'left' rather the sort of names you might expect such as X or Y because common easily pronounced words are more reliably recognized by the speech recognition system. Before creating your own charting commands check the manual section on expression syntax and evaluation, and the one on the built-in charting function. The formula for the patterns is. The angle 'theta' is set to vary from 0 to 2π. The value 'delta' produces a kind of rotation effect, but has been left as π/2 in this example. The ratio 'top/bottom' controls the interesting patterns. Normally 'top' and 'bottom' are set to integer values. 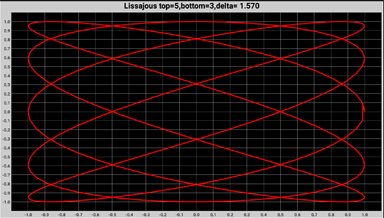 Make sure you say the command 'pattern start' to get your first Lissajous figure. This will initialize all the variables. After that you can create a new pattern by saying something like 'pattern top 7', or 'pattern bottom 3'. The four bars are joined by hinges. We have named the bars 'bottom', 'top', 'left' and 'right' to make speaking them easier. In this configuration, the bottom bar is fixed and we sweep the right bar around it's bottom hinge through an angle theta from 0 to 2π. The linkage can usually be assembled in two ways. One way is shown in the diagram, and the other way (for that diagram) is with the point L much closer to the bottom of the 'right' bar. The position of the point R.
The position of the point L.
The position of the midpoint between L and R.
The position of the point L in the alternate position. The position of the midpoint between L and R while L is in the alternate position. 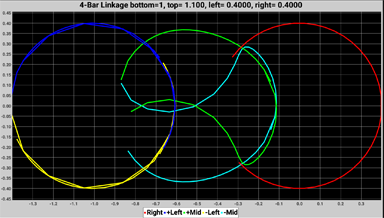 The legend for the graphs at the bottom of the image is labelled so that one set of positions for L and the midpoint are '+Left' and '+Mid', while the alternate set are named '-Left' and '-Mid'. Its not difficult to choose lengths for the links which make it impossible to completely rotate the right link without breaking the hinges. If you should choose such values you will see that the red graph for the point R won't be a full circle. Make sure you say the command 'link start' to get your first chart. This will initialize all the variables. After that you can create a new set of graphs by saying something like 'link top 1.1', or 'link right 0.3'. If the links move a long way for a small change in theta at some point, parts of the graph might not be smooth. If you want the graphs to be smoother increase the step count (currently 100) in the command. Increasing the count will mean it takes longer for the chart to be calculated! For this chart we have name the coefficients 'one', 'two', 'three' and 'four' instead of a,b,c,d. This makes them easier for the speech recognizer to pick up correctly. Make sure you say the command 'cubic start' to get your first cubic curve. This will initialize all the variables. After that you can create a new curve by saying something like 'cubic set 2 equals 0.3'. This would set coefficient 'two' to 0.3 before drawing the curve. Don't say 'cubic set 2 to 0.3' as the 'to' is likely to get picked up as the number '2'! There are no parameters for this graph. To draw it say 'cardioid'. The commands are used to prepare an email before sending it to an email app for final review and sending. Most groups of commands manipulate a single field (eg. the subject field) within the email being constructed. The fields are stored inside FlickStart until the phoone is restarted so commands are provided to restart each field and to say what it contains (to allow confirmation of the contents). email body [text] - Initialize the body to the spoken text. email add [text] - Add the spoken text to the end of the body. email undo - Remove the last section added. This command can be repeated until tthe body is empty. email reset body - Blank out the whole body. email say body - Speak the contents of the body. FlickStart provides for up to 10 addresses to be placed in the email's address field. The addresses are accessed by number starting at 1 (although the first address doesn't need to have a number. Addresses must be selected from the phone's contact database. You specify a contact name and that contact needs to have an email address set. Any blank (or reset) addresses will be ignored. email address [contact] - Sets the first email address from the contact named. email address [number] [contact] - Sets the numbered email address from the contact. email reset address [number] - Blank the numbered address. email say address - Speak the contact names for all the non-blank addresses. If you want to set CC email addresses, this is the group of commands for setting them up. The commands manipulating CC addresses operate exactly the same way the address field commands do. The commands are exactly the same as well except the word 'address' is replaced by 'CC'. email CC [contact] - Sets the first CC address from the contact named. email CC [number] [contact] - Sets the numbered CC address from the contact. email reset CC - Blank the CC first address. email reset CC [number] - Blank the numbered CC address. email say CC - Speak the contact names for all the non-blank CC addresses. If you want to set BCC email addresses, this is the group of commands for setting them up. The commands manipulating BCC addresses operate exactly the same way the address field commands do. The commands are exactly the same as well except the word 'address' is replaced by 'BCC'. email BCC [contact] - Sets the first BCC address from the contact named. email BCC [number] [contact] - Sets the numbered BCC address from the contact. email reset BCC - Blank the BCC first address. email reset BCC [number] - Blank the numbered BCC address. email say BCC - Speak the contact names for all the non-blank BCC addresses. email subject - Set the subject of the email. email say subject - Speak the current subject. The 'email compose' command is the final step in preparing an email. After creating the email body, subject and address, you use 'email compose' command to export the email to your email app where you can review the email before sending. email compose - Send all the fields of the email to the defailt email app. email start - Clear all the email fields ready for a new email. 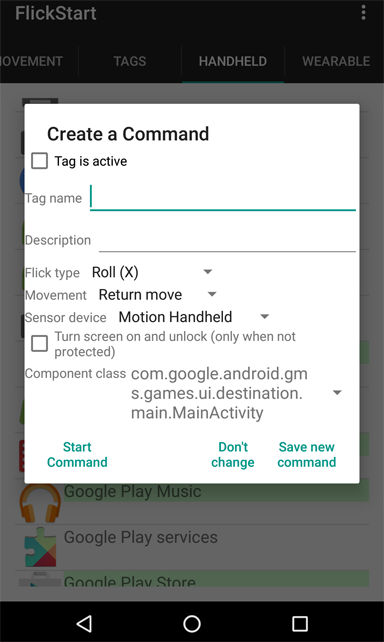 The Google maps app allows other apps to do a few operations via Android Intents and they are used in this set of commands. Current Location Display - The commands can display the current location and zoom in and out hands free. Query for Location or Points of Interest - These commands make Google Maps appear and display an area pertinent to the spoken query. Queries can be just addresses, or can be points of interest like cafes. Start Turn by Turn Instructions - These commands get Google Maps to create a turn by turn session to the spoken address. Further details on the parameters the Google Maps app allows are given here. 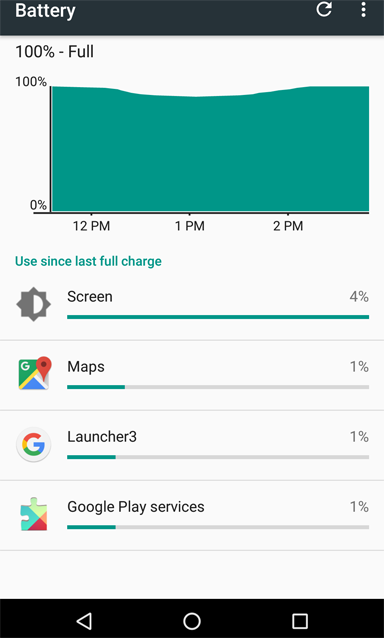 Unfortunately the Google Maps app doesn't provide a mechanism to give calling apps any data back, so the number of things that can be done via the Android Intent are a bit limited. The group of commands in this tag are an example of how you might apply clipboard contents to existing tags. All the commands in this example direct clipboard contents to fields in a Calendar event you are creating bit by bit before storing the event in your Calendar. Each command assumes you have found some text and done a copy operation to put the text in the Clipboard. Each command puts the current clipboard contents into a different field of a calendar event using speech. For instance if you say 'clip to calendar title', the current Clipboard contents are copied into the title of the Calendar event you are building. Saying 'clip to calendar start' would copy the clipboard contents into the start time field of the Calendar event. The first set of commands are used to look up a contact and return some information about the contact. For instance if you say 'contact work Nancy' the response will be the contact's full name followed by their work number (if there is one). These commands can you give you the mobile number, work number, email address and IM name. In the case of the IM name, there is a command which picks out the 'Skype' IM name. You can duplicate this command and change the target IM (eg. 'Yahoo') to suit. The second set of commands are used if you have looked up a contact using a FlickStart command (eg. the SMS commands). You can get the same information for the contact found on that last lookup by saying the commands described above but using 'last' as the contact name.